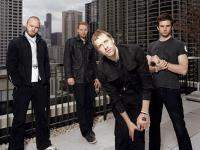 Coldplay are an English alternative rock band that was formed in London, in 1998, and consists of Chris Martin (lead vocals, keyboards, guitar), Jonny Buckland (lead guitar), Guy Berryman (bass guitar), and Will Champion (drums, backing vocals, other instruments). The band quickly gained popularity with their first hit single, "Yellow", followed by their debut album, Parachutes (2000), which won Best British Album at the 2001 Brit Awards. In 2008, the band released their fourth album, Viva la Vida or Death and All His Friends, which yielded five hit singles, "Violet Hill", "Viva la Vida", "Lost! ", "Lovers in Japan" and "Strawberry Swing". "Viva la Vida" became the band's first song to reach number one in both the United States and the United Kingdom. "Lost! ", have several official versions including a version that features American rapper Jay-Z. And you may download Coldplay's best selling album, Viva la Vida or Death and All His Friends, in mp3 from our site.